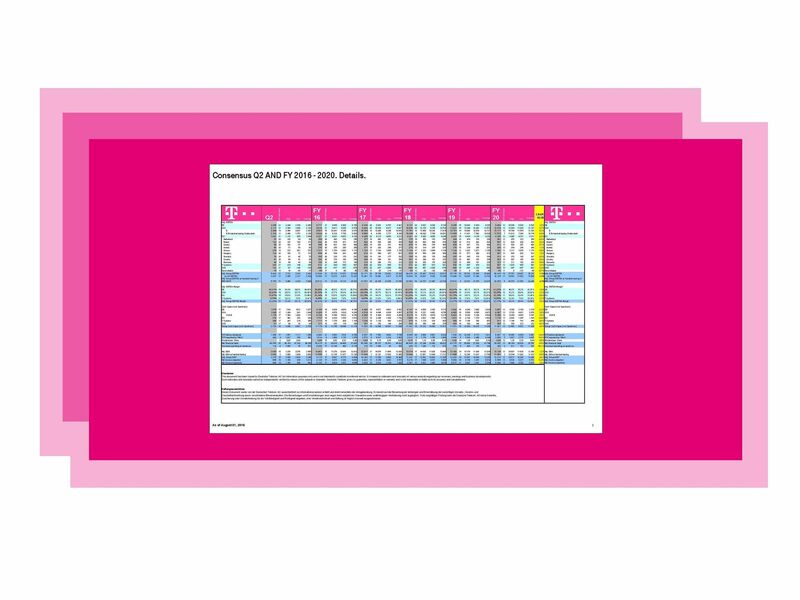 On February 21, 2019 the Deutsche Telekom published its results for the 2018 financial year. You will find all informations and documents here. The conference call for investors and analysts is completed. This financial statement refers exclusively to the legal entity Deutsche Telekom AG. For the consolidated Group numbers please refer to the annual report. Disclaimer for analysts' estimates: The Consensus has been issued by Deutsche Telekom AG for information purposes only and is not intended to constitute investment advice. It is based on estimates and forecasts of various analysts regarding our revenues, earnings and business developments. Such estimates and forecasts cannot be independently verified by reason of the subjective character. Deutsche Telekom gives no guarantee, representation or warranty and is not responsible or liable as to its accuracy and completeness. On November 8, 2018 Deutsche Telekom published its financial results for the third quarter 2018. The Consensus has been issued by Deutsche Telekom AG for information purposes only and is not intended to constitute investment advice. It is based on estimates and forecasts of various analysts regarding our revenues, earnings and business developments. Such estimates and forecasts cannot be independently verified by reason of the subjective character. Deutsche Telekom gives no guarantee, representation or warranty and is not responsible or liable as to its accuracy and completeness. On August 9, 2018 Deutsche Telekom published its financial results for the second quarter 2018. On May 9, 2018 Deutsche Telekom published its financial results for the first quarter 2018. On February 22, 2018 the Deutsche Telekom published its results for the 2017 financial year. You will find all informations and documents here. On August 3, 2017 Deutsche Telekom published its financial results for the second quarter 2017. On May 11, 2017 Deutsche Telekom published its financial results for the first quarter 2017. CEO Tim Höttges: "Our investments in the United States have paid off." On Thursday 2, March 2017 the Deutsche Telekom published its results for the 2016 financial year. Find the annual report as well as further information here. You find the recording of the conference call here and on our Youtube channel. On November 10, 2016 Deutsche Telekom published its results for the third quarter 2016. On August 11, 2016 Deutsche Telekom published its results for the second quarter 2016. Please find all respective details and documents here. On May 4, 2016 Deutsche Telekom published its results for the first quarter 2016. You find all respective details and documents here. Media information: Deutsche Telekom invests for customers and in broadband in Germany. On Thursday 25, Februar 2016 the Deutsche Telekom published its results for the 2015 financial year. Find the annual report as well as further information here. Adjusted net profit up by almost 70 percent to 4.1 billion euros. 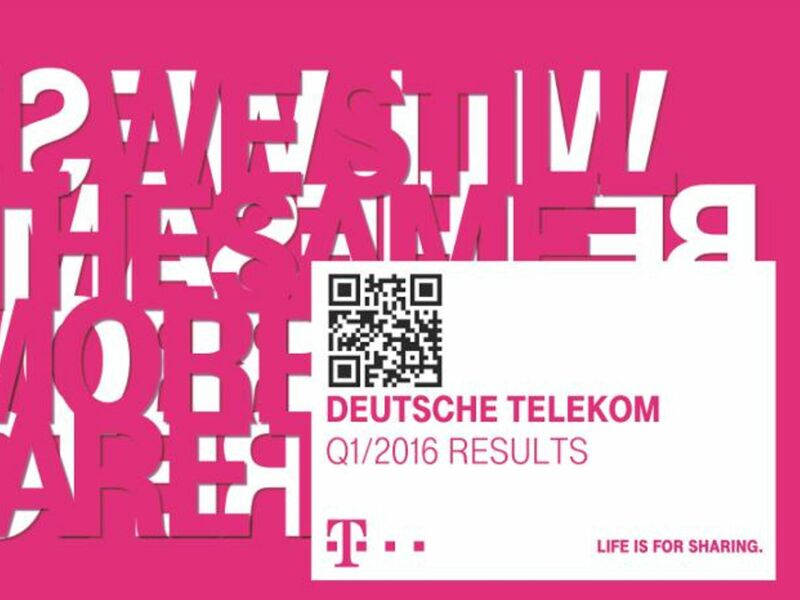 On Thursday 5, November 2015 the Deutsche Telekom published its results for the third quarter 2015. Find the current report as well as further information on the financial figures here. Deutsche Telekom published its second quarter results 2015 on August 06, 2015. Find the current report as well as further information on the financial figures here. On May 13, 2015 Deutsche Telekom published its results for the first quarter 2015: revenue and profit grew strongly. Please find all respective details and documents on this page. Deutsche Telekom AG published its annual report 2014 on February 26, 2015. You find further information on the financial figures here. Deutsche Telekom AG published its third quarter results 2014. Find the current report as well as further information on the financial figures on that date here. 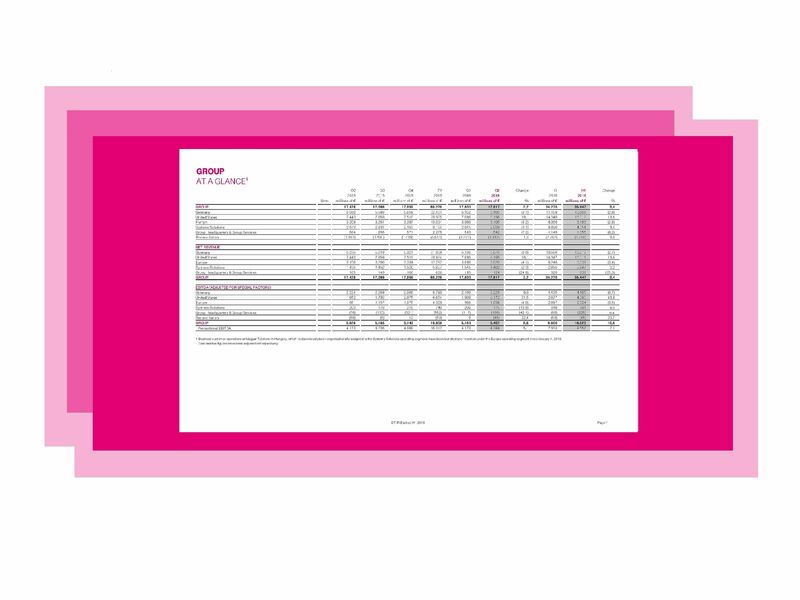 Deutsche Telekom AG published its half-year results 2014. Find the current report as well as further information on the financial figures on that date here. Deutsche Telekom AG published its first quarter results 2014 on May 8. Tim Höttges, CEO and Thomas Dannenfeldt, CFO discussed the results in the conference call for investors and analysts. Deutsche Telekom AG published the annual report 2013 on March 6, 2014. Deutsche Telekom published the Q3-2013 results on Thursday, November 7, 2013. Find the current report as well as further information on the financial figures here. Deutsche Telekom accelerates growth in the third quarter. Deutsche Telekom published the Q2-2013 results on Thursday, August 8, 2013. Germany: Return to underlying mobile service revenue growth (+1.0%) against negative market trend - outperfroming competition! 1.38 million mobile contract net additions Group-wide. Deutsche Telekom published the Q1-2013 results on Wednesday, May 8, 2013. DE: Underlying mobile service revenue trend improved to -0.1% - return to positive underlying growth expected for 2013. Deutsche Telekom published the Q4-2012 results on Thursday February 28, 2013. All estimates as of February 20, 2013. The estimates for 2013 and the following years are based on the full consilidation of MetroPCS. Q2 EBITDA nearly 3% above consensus. Q2 FCF 10% above consensus. Well on track for FY guidance. Full year guidance fully reiterated. Shareholder remuneration commitment fully reiterated. CEO René Obermann: "We are keeping our word and providing a good deal of reliability to the market with very solid figures." Q2 Net income +76% y.o.y. DE mobile service revenue growing ex Drillisch effect. Excellent operatinals: DE line losses -20% y.o.y. on record low (-236k). DE Entertain +41% y.o.y. Mobile contract net adds +464k. Stabilization in Europe, slight growth in U.S.
Deutsche Telekom met its financial targets for the 2011 financial year despite a difficult business environment for the telecommunications industry as a whole. Adjusted EBITDA was EUR 18.7 billion, with a EUR 0.2 billion negative impact owing to changes in exchange rates. Adjusted for this exchange rate effect included in the forecast, the Group's adjusted EBITDA was EUR 18.9 billion, while Deutsche Telekom's guidance for the year was around EUR 19.1 billion. Exchange rate fluctuations had a EUR 0.1 billion negative impact on free cash flow. The reported figure of EUR 6.4 billion hence corresponds to the forecast figure of EUR 6.5 billion. The Supervisory Board and the Board of Management will propose to the shareholders' meeting on May 24 a stable dividend of 70 cents per share, corresponding to a payout rate of 47 percent of free cash flow. "In 2011, the Company operated in a challenging environment in every respect, a situation that is not going to change this year," commented René Obermann, Chairman of the Board of Management of Deutsche Telekom. "Our capacity for innovation, cost discipline, and readiness for change are vital assets as we prepare to master these challenges in 2012, too." Deutsche Telekom has confirmed its financial targets for the full year 2011 with solid third-quarter figures despite persistently difficult conditions characterized by a weak economy and the negative effects of decisions by governments and regulatory authorities in several countries. Between July and September 2011, adjusted EBITDA from continuing operations - i.e., excluding the discontinued operation in the United States - totaled EUR 3.9 billion, a decline of 2.7 percent compared with the same period last year. Revenue decreased 4.1 percent in the same period to EUR 11.0 billion. Including U.S. business, adjusted EBITDA fell 2.3 percent and revenue de-clined by 6.0 percent. Net profit increased by 14.6 percent to EUR 1.1 billion, while adjusted net profit grew by 48.9 percent to EUR 1.3 billion. At EUR 1.7 billion, free cash flow in the third quarter was 9.2 percent below the prior-year figure. "We have once again demonstrated that we can stand our ground in a difficult environment," said René Obermann, Chairman of the Board of Management of Deutsche Telekom. "We cannot afford to be complacent in our efforts as the challenges will continue to intensify." The company has further trimmed its operating costs, having already saved EUR 1.5 billion in the first nine months of the year with the Save for Service initiative. This has brought the cost base down by EUR 3.9 billion in total since 2010. Save for Service is targeting savings of EUR 4.2 billion for 2010 through 2012. At EUR 2.1 billion in the third quarter of 2011, 3.8 percent above the prior-year figure, the Group's investments - measured in terms of cash capex - remained at a sustained high level. Deutsche Telekom has confirmed its guidance for the full year 2011. The Group continues to expect adjusted EBITDA from continuing operations of around EUR 14.9 billion. Adjusted EBITDA of around USD 5.5 billion is anti-cipated from business in the United States. Free cash flow of the Group is expected to total at least EUR 6.5 billion. Deutsche Telekom maintains strong domestic business and sees improvement in many European markets. Deutsche Telekom’s financial figures for the second quarter of 2011 are characterized by significantly improved trends in a number of operational areas and a 17-percent increase in adjusted net profit, causing the adjusted EBITDA margin to rise to over 40 percent. Key figures improved in many European countries compared with the first quarter despite a persistently tough economic environment. In other areas, challenges remain. This is particularly true in the United States. Find the 2011 half-year report to download as a PDF along with related materials here from 8 a.m. CET. Deutsche Telekom has confirmed its guidance for the full year following the first quarter of 2011. Business in the first three months was shaped by positive developments overall in Germany and at T Systems, while the companies in the Europe operating segment faced a host of challenges, as did T-Mobile USA. in the North American market that will also benefit in particular the company's customers in this region. The deal is still subject to legal and regulatory approval in the United States. Deutsche Telekom brings the 2010 financial year to a successful close and expects almost stable development in 2011. Deutsche Telekom achieved and, in some cases, even exceeded its financial targets for 2010. The Group recorded adjusted EBITDA of EUR 19.5 billion in the financial year just ended, matching the forecast made at the start of 2010 (excluding the deconsolidated T-Mobile UK that accounted for around EUR 0.5 billion). At EUR 6.5 billion, free cash flow was considerably higher than the EUR 6.2 billion originally expected. Business in Germany was strong, with mobile Internet, smartphones, broad-band lines and Internet-based (IPTV) television as the growth drivers. Net revenue increased by 0.4 percent to EUR 62.4 billion excluding the UK. At EUR 3.4 billion, adjusted net profit was on a par with the 2009 figure. Unadjusted for special factors, net profit stood at EUR 1.7 billion, a substantial increase from EUR 0.4 billion in the previous year. "We delivered solid figures in 2010. We have battled through the headwind caused by the economic environment, special taxes in several countries, and stiff competition. I am particularly pleased about the slight increase in revenue," said René Obermann, CEO of Deutsche Telekom. "At the same time, we have started to implement our new strategy and invested in the future. You have to sow before you can reap." Find the annual report 2010 here for download on February 25, 2011 at 8 a. m.
The conference call for analysts will be streamed live here at 2 p. m. (CET). Deutsche Telekom confirms its guidance for the full year 2010. Deutsche Telekom has confirmed its guidance for the full year following a solid third quarter. Excluding the effects of the joint venture in the United Kingdom, Deutsche Telekom expects to generate adjusted EBITDA of approximately EUR 20 billion and free cash flow of at least EUR 6.2 billion. By the end of the first nine months, adjusted EBITDA amounted to EUR 14.9 billion, while free cash flow stood at EUR 4.8 billion. Deutsche Telekom posts strong second quarter and confirms its guidance for 2010. Deutsche Telekom continued the healthy development of the first quarter of 2010 in the period April to June and confirms its guidance for the full year. Revenue in the Germany operating segment stabilized in the second quarter and, at the same time, adjusted EBITDA increased. T-Mobile USA continued its strong growth in the mobile data sector and recorded an increase in the number of contract customers for the first time after three quarters. The EBITDA margin remained at a high level in the Europe segment despite negative regulatory and economic factors impacting several markets. T-Systems increased revenue generated outside the Deutsche Telekom Group and internationally, and improved its EBIT margin. Deutsche Telekom got off to a good start in the 2010 financial year, recording sound figures in the first quarter. Adjusted EBITDA increased by 1.6 percent compared with the first quarter of 2009 to EUR 4.9 billion. With revenue almost stable – down 0.6 percent to EUR 15.8 billion – the adjusted EBITDA margin improved by 0.6 percentage points to 30.9 percent. The development of adjusted net profit was particularly encouraging, increasing by 36 percent year-on-year to EUR 0.9 billion. Unadjusted net profit jumped by just under EUR 2 billion from EUR ‑1.1 billion to EUR +0.8 billion. The free cash flow trend was also impressive, with free cash flow of EUR 1.4 billion being recorded in the first three months of 2010, up from EUR 0.4 billion in the first quarter of 2009. Deutsche Telekom has achieved its revised financial guidance for the full year 2009, increasing the Group’s profit margin. While revenue increased 4.8 percent to EUR 64.6 billion compared with 2008, adjusted earnings before interest, taxes, depreciation and amortization (EBITDA) grew 6.2 percent to EUR 20.7 billion. This resulted in an adjusted EBITDA margin of 32.0 percent, up from 31.6 percent the previous year. The increase in profitability is even more marked in the fourth quarter of 2009: while revenue increased 0.6 percent year-on-year, adjusted EBITDA rose by 8.6 percent. Net revenue of the Group increased by 6.2 percent year-on-year in the first nine months of 2009 to EUR 48.4 billion. by EUR 3.5 billion to EUR 27.4 billion. The proportion of net revenue generated outside Germany increased from 52.6 percent to 56.7 percent. for special factors1 increased from EUR 14.8 billion in the prior-year period to EUR 15.6 billion. Net profit amounted to EUR 0.4 billion in the first nine months of 2009, compared with a net profit of EUR 2.2 billion in the first three quarters of 2008. Net profit adjusted for special factors amounted to EUR 2.5 billion, slightly lower than in the first nine months of 2008. Free cash flow before dividend payments was EUR 5.1 billion compared with EUR 5.8 billion in the first three quarters of 2008. Net debt increased by EUR 4.2 billion compared with the end of 2008 to EUR 42.4 billion. Deutsche Telekom posts good figures to continue the positive development of the prior quarter. The Group therefore confirms its guidance for the year as adjusted in April despite the recent negative development in exchange rates, particularly the marked weakness of the U.S. dollar against the euro over the course of the year. Cost-cutting measures and improvements in efficiency continue to bear fruit: Deutsche Telekom posted year-on-year increases in profitability in all operating segments between July and September. Having recorded positive business development in the second quarter, Deutsche Telekom is well on its way to achieving its targets for 2009. The Group increased its net revenue by 7.4 percent in the second quarter to EUR 16.2 billion and EBITDA adjusted for special factors by 8.4 percent to EUR 5.3 billion. Adjusted net profit grew by 19.4 percent year-on-year in the second quarter to EUR 0.8 billion. The Greek company OTE contributed EUR 1.5 billion to net revenue and EUR 0.5 billion to adjusted EBITDA of the Group in the second quarter of 2009. Reported revenue increased by 6.2 percent to EUR 15.9 billion. At EUR 4.8 billion, the Group's adjusted EBITDA was up 2.7 percent on the previous year. Adjusted net profit declined by 12.7 percent to EUR 0.7 billion. The number of mobile customers increased by 6.8 percent to a total of 148.4 million. The number of DSL lines increased year-on-year by 8.0 percent to 17.0 million.